The Dyson Handheld Vacuum Tool Kit Part No: 919648-02 includes four Dyson-designed tools for a cleaner home and car interior. Also known as: 912696-01, 913049-01. Made by Dyson. The Dyson Handheld Vacuum Tool Kit comes with three Dyson tools to effectively clean awkward spaces with your Dyson Handheld Vacuum. Also known as: 912696-01, 913049-01. 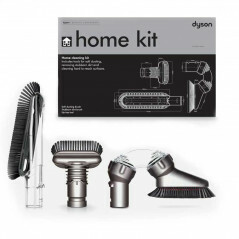 Soft dusting brush - soft bristles gently dust delicate surfaces with your Dyson handheld. Keeps shelves, blinds and lighting dust free. Stubborn dirt brush - with stiff bristles for dislodging dried-in and stubborn dirt from upholstery and carpets. Wide nozzle tool - attaches to your Dyson handheld to pick up large debris from around the home and car. Extension hose - extends to reach confined spaces such as beneath car seats and behind cabinets.